One of the things that I find fascinating are the different ways human society benefits from sharing information. Let me give you an example in the geospatial arena. GITA conducts an annual survey of its members. The 2005 report collected information from 294 members which are utility companies from the electric, gas, pipeline, public, telecom, and water sectors. The survey asked participants if they were using more than one geospatial platform, and secondly, if they were, how did they share data between the systems. Over 60% of participants reported were using more than a single platform. This is up considerably from the previous year's survey, where between a third and a half reported using more than one platform. For both years two thirds of the companies with more than one geospatial platform were sharing data between them. But even more interesting, although third party translation software was identified most often as the method for data sharing, an increasing number of participants said they were using "functionality native to their selected GIS" and did not require third party translation software. I would suggest that we are seeing an increasing number of organizations who are centralizing their network infrastructure in a relational database. This is now possible because most relational databases are spatially-enabled including Oracle, DB2 (IBM), Informix (IBM), PostgreSQL/PostGIS, and even MySQL if you use the ISAM storage engine. Oracle is still the functionality and market leader. In the last three surveys that IDC conducted, over 80% of companies using a spatial database were using Oracle (Locator or Spatial). 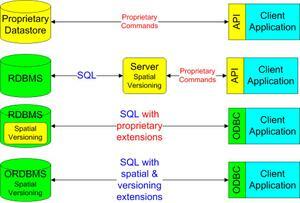 It is interesting to see how sharing spatial data has evolved over the years from proprietary files through proprietary schemas for storing spatial data in relational database management systems, to the current state where you can store just about any spatial data with topology in a modern object-relational database management system. The advantage of ORDBMS's is that data is accessible is through an open query language, SQL, and an open interface standard such as ODBC, JDBC, and OLEDB. The traditional architecture that organizations with more than one geospatial platform employ results in information silos. Engineering, records, and planning typically used applications from different vendors each with its own proprietary data store. 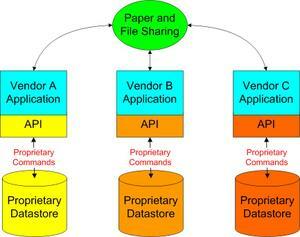 Paper (data re-entry) and file sharing were used to exchange data. A typical example is one we have described already, engineering design typically used a CAD application and stored the data in DWG or DGN files. The records or GIS team used a traditional GIS and stored spatial data in proprietary data files supported by the GIS vendor. The planning department probably used another application and stored their data in another set of proprietary files. 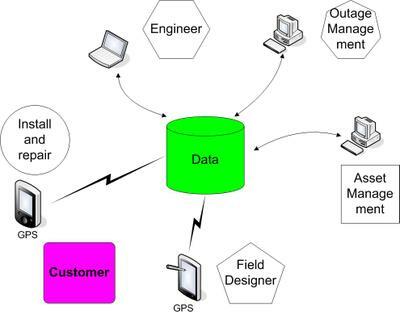 An open spatially-enabled data store makes it possible to share data between applications including applications from different vendors. This means that many people with different roles in the organization can share a single point of truth, rather than the more typical situation where the engineering, records, and planning teams use applications from different vendors each with its own proprietary data store. What this simple concept enables is everyone in different departments in the organization sharing the same information in the same repository, which eliminates data redundancy and the associated redundant processes. This includes the engineers in the central office, the financial people responsible for managing assets, the install and repair people in the field, surveyors in the field, and outage management staff. The benefits of a centralized spatially-enabled database are the concrete business benefits that we have outlined in previous blogs about ENMAX and Telesp, better quality of service to customers and reduced costs. I was fortunate to attend Map India where I gave presentations on some of the themes of this blog. This year Map India was especially interesting for several reasons. First of all the theme of the conference was "Finding Mainstream", which brought home to me how all over the world people have recognized that geospatial has become part of mainstream IT and is no longer a niche. This is one of the reasons that I think 2005/2006 is such an important time for geospatial technology. Dave Sonnen, who prepares IDC's annual spatial information management report, has been predicting for years that spatial-enabling IT was going to become a much larger market than traditional GIS and would at some point overtake traditional GIS. 2005/2006 is the first time when it feels that this crossover is imminent. Another reason that Map India was so interesting is Delhi, which is where MapIndia took place this year. Delhi and the Delhi area were at the centre of the Mughal empire and Delhi is full of remarkable monuments that have endured from that period. One of the most remarkable is Humayun's Tomb, which with its extensive garden, is located right in Delhi. It was the first what is called garden tomb in the Indian subcontinent and was a precursor of the more famous Taj Mahal. Another reason that Map India was so interesting is that I had an opportunity to chat with Sanjay Kumar and Maneesh Prasad of GIS Development, which is one of the organizers of the event. Sanjay reminded me that Autodesk had been a sponsor of the first Map India nine years ago and that next year will be quite special, because it will be Map India's decenary . We chatted about some of the interesting trends in geospatial technology and in particular about open source geospatial, to which the January issue of GIS Development was devoted. To me this is another important reason that 2005/006 is such an important period for geospatial technology because we are seeing a recogniton of the maturing of open source geospatial technology. 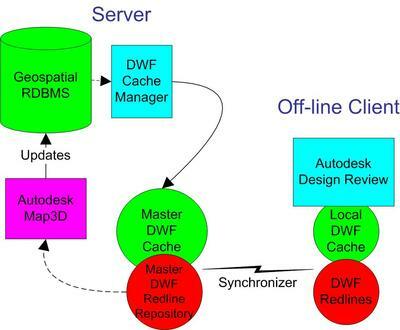 At the end of 2005 Autodesk announced that it was open sourcing the next release of MapGuide, called MapGuide Open Source. And then early in February of this year a number of folks active in the open source geospatial world including people representing GDAL, GeoTools, GRASS, Mapbender, MapBuilder, MapServer, OSSIM and MapGuide Open Source got together to create an open source geospatial foundation (www.osgeo.org), which I recommend that you check out. I like to draw a parallel between where web mapping is today and to the formation of the Apache Foundation, when most of the major IT vendors recognized that it made more business sense to support the Apache web server project than for each vendor to develop its own proprietary web server. One of the events that distinguished Map India from other geospatial events is the evening of ghazals that was organized for the attendees. This is an experience you really have to go to the Indian subcontinent for. 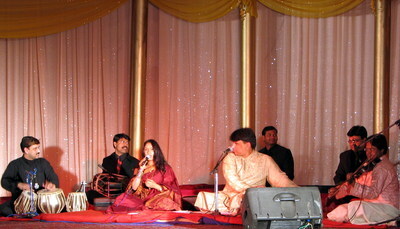 Ghazals are a form of poetry that is sung to the accompaniment of traditional Indian instruments and other instruments, in this case a violin, which you should be able to make out on the right in the photo. I believe ghazals were historically written in Urdu, but you can find them in a variety of languages including English (http://ghazalpage.net/). Hello and welcome to a new blog that will have two key focuses, geospatial IT and how utilities, telecommunications firms, transportation organizations, and others who have to manage network infrastructures have used it to address real-world business problems. I spend a significant part of my time talking about these topics at geospatial and infrastructure conferences in various parts of the world and I am very excited about having a another forum like this to discuss these things with you, so I am looking forward to your feedback. I spend an even greater portion of my time talking to our largest customers in various parts of the world, and one of things that I find most fascinating is the commonality in the problems that utilities and telecoms and other folks managing network infrastructure are facing in different parts of the world. Equally fascinating is the different approaches that people in different geographies take to solve these problems. Let me outline some examples of common problems. If you look at the process that a utility or telco uses to design and manage network infrastructure, you will find more frequently than not that the process is similar to what I've outlined in the illustration to the right. There are some serious problems with this process that inhibits the ability of a utility or telco to improve the quality of service to its customers and to reduce operating costs. I'll call one of the problems the "as-built problem". This problem is often the result of having different teams responsible for engineering design and maintaining as-builts or records. 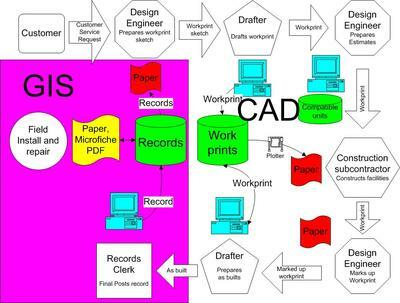 The engineering design folks typically use a CAD tool to design network infrastructure. The records folks use a traditional GIS application to maintain a record of the network infrastructure after it is constructed. The problem arises because almost invariably the engineering design deliverable is a piece of paper called a construction drawing. (It is actually paradoxical that the engineering design team uses sophisticated digital design tools, but the end result is a very old-fashioned piece of paper. If you are familiar with mechanical design, there is a parallel situation with what are called aperture cards.) The construction drawing is used by the construction contractor to build the network infrastructure. After construction is complete, the construction drawing comes back to the records team as a piece of paper called an as-built, which may have been marked up or red-lined because the contractor may have had to make minor changes to the original design. A member of the records staff digitizes the construction drawing into the records database. At most organizations there is a backlog of as-builts waiting to be entered into the records database, and the backlog can stretch anywhere from 45 days to several years. Just an aside. I visited a large telco a few years back and asked them about their as-built backlog. Their reply was interesting because they said they didn't have a backlog. I expressed my surprise and and asked the question a different way, how long does it take as-builts to get into the records database. Their reply was 45 days, which is really quite remarkable for a telco of their size, but underlines how serious the backlog problem is. Most utilities and telcos have a lot of people in the field. They are sometimes called install and repair staff, troublemen or linesmen, or field maintenance staff. They are usually customer-facing. In fact in many cases, they may be the only people you meet face to face from your local utility or telco. A large telco in the US or UK serving tens of millions of customers, for example, will have tens of thousands of field staff. A large power company serving millions of customers will have thousands of field staff. The fascinating thing is that the field staff usually know more about the location, detailed properties, and condition of network infrastructure than anyone else in the organization because they work with it daily. Not only that, but the field staff need accurate, reliable data to be productive. When they go out to a site to install or repair equipment, if they know in advance what equipment is up the pole or down the manhole, they can make bring the right equipment and material. An interesting statistic that many utilities and telcos capture is "returns", which is the proportion of work orders that require one or more return visits. At many utilities and tel cos returns amount to between 25 and 30% of all install and repair jobs. This is expensive and it means that instead of a crew completing on average 5 work orders per day, they are only able to complete 4 work orders. Multiply that by the number of field staff and you can see how expensive this is. In many utilities and telcos there is either no feedback loop from the field to records or if there is, data such as red-lines and markups from the field are treated as low priority and are seriously backlogged. This means that the field staff who need reliable data to do their job productively and know more about the overhead or underground network infrastructure are discouraged from feeding back corrections and updates that would lead to better data quality. A result of the first three problems I described is that the network infrastructure data in the central records is often out of date and inaccurate. This is the result of backlogs, errors introduced during data entry of construction drawings, and the lack of a feedback loop from the field. The four problems I've described are common to many utility and telcos around the world. What I want to do is tell you how some utilities and telcos are addressing these problems in very innovative ways. I also want to tell you about some transportation customers I met with recently at a conference in Montreal today and at MapIndia two weeks ago. Also I want to tell you why I think 2005/2006 is a turning point year for geospatial technology and why I think this is the most exciting period since the introduction of the 8080, for those of you who can remember. One thing I will pass along that was confirmed by Oracle at the conference in Montreal is that Oracle XE, which is the free version of Oracle RDBMS, will include Locator, which is the basic spatial capability that is available in Oracle Standard Edition. 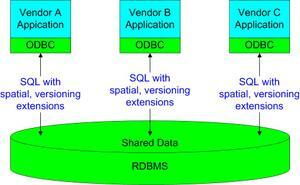 This means that everyone can download, try, and use Oracle's spatial capabilities. Finally, I would encourage anyone who hasn't been to Ottawa, Canada, where I live, to seriously consider a visit. But make sure you do it in January or February. I took this picture of the Rideau canal last Sunday. This is only about 1 km of the canal. You can ice skate more or less in a straight line for 8 km (5 mi), and you usually can do this for 2 and half months of the year, from Boxing Day (Dec 26) through the middle of March. This year Ottawa has been unseasonably warm. Last weekend was the first really good day for the canal. You can see the whole city is out there including all ages from infants to grandmothers/fathers.